The Keitech Tungsten Fine Guard Jig Head provides the ultimate finesse that you are looking for. Keitech's no-lead, tungsten powder/polymer compound limits the environmental impact, while providing a technical advantage. The Keitech Fine Guard Jig Head offers a tungsten teardrop head, a 5 fiber weedguard and is backed with a #2 Katsuichi hook. 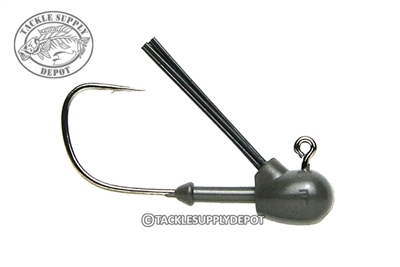 The Katsuichi hook provides a specific bend that enhances the hook's strength, resulting in solid hook-ups. Pair the Keitech Tungsten Fine Guard Jig Head with the Keitech Little Spider or Swing Impact for a deadly combination around cover or rig your favorite small worm on Wacky for the one of the hottest finesse techniques; Flick Shake.